Pancho’s Pico de Gallo is a wonderful, low-fat relish to make. This will store for a couple of days in your refrigerator. It is also great with eggs in the morning. Pancho’s Mexican Buffet is a favorite of many people in the South. This chain was started in the 1950’s. As of now they only have a handful of locations left. This restaurant serves up many of your favorites in a cafeteria style setting. When you sit down with your tray, and later you want more you simply ‘Raise the Flag’, and they will bring you more of whatever you want. I love some of their dishes. Their pico de gallo, their chili rellenos, and their chicken tortilla soup. They make everything on the site, and the food is freshly made and tasty. I love that they have their equivalent of a salad bar. On their salad bar, you will find fresh chopped onions, cilantro, pico de gallo, sour cream, and so many other items. Their freshly made pico de gallo was one of my favorites. It goes with everything. You can make their pico de gallo at home with this easy copycat recipe. For this recipe, I suggest you use white or red onions. The white onions tend to have a little less heat than yellow onions, and the red onions look beautiful. Looking for some recipes that would go well with this pico de gallo? 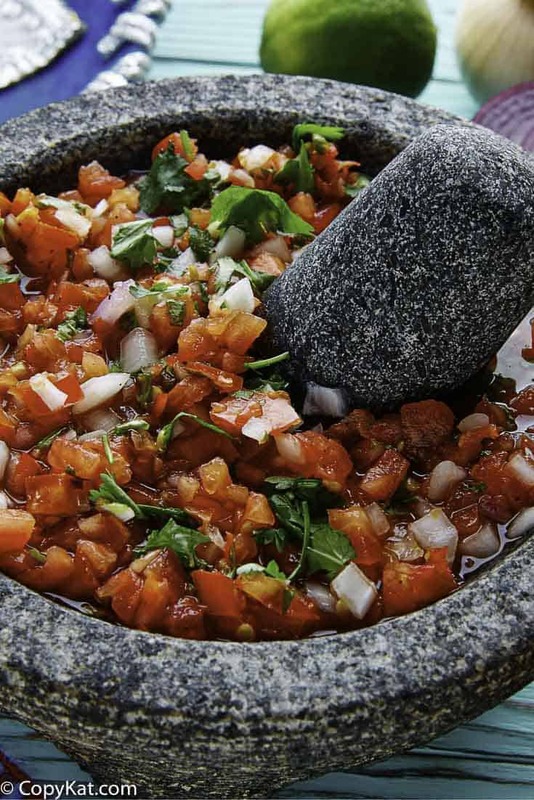 Make Pancho's Pico De Gallo at home. Simply chop everything and combine. Stir to mix everything well, and refrigerate for a couple of hours before serving. If you don't like jalapenos, or if they are too hot for you, be sure to remove the seeds and the pith inside of the peppers before chopping them up, and using them in the mixture. This is really good. It is one of my favorite pico de gallo!